Scientists believe newly-discovered, 15,500-year-old spear points are the oldest weapons ever found in North America. The findings raise new questions about the settlement of early peoples on the continent. As reported in Science Advances, scientists found numerous weapons—about 3-4 inches long—while digging at the Debra L. Friedkin site, named for the family who owns the land about 40 miles northwest of Austin in central Texas. The site has undergone extensive archaeological work for the past 12 years. 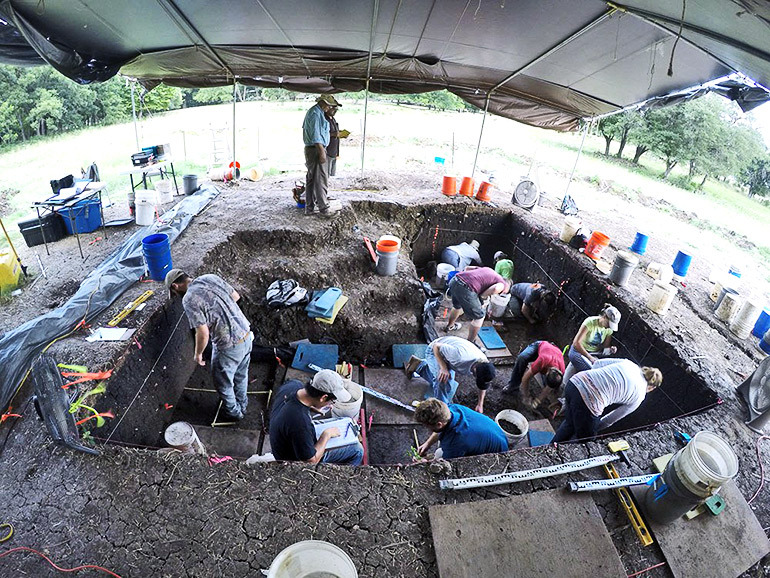 Researchers found spear points made of chert and other tools red under several feet of sediment that dating revealed to be 15,500 years old, and pre-date Clovis, who for decades scientists believed to be the first people to enter the Americas. “There is no doubt these weapons were used for hunting game in the area at that time,” says Michael Waters, a professor of anthropology and director of the Center for the Study of the First Americans at Texas A&M University. “The discovery is significant because almost all pre-Clovis sites have stone tools, but spear points have yet to be found. These points were found under a layer with Clovis and Folsom projectile points. Clovis is dated to 13,000 to 12,700 years ago and Folsom after that,” Waters says. Clovis is the name given to the distinctive tools people made starting around 13,000 years ago. The Clovis people invented the “Clovis point,” a spear-shaped weapon made of stone that researchers have found in Texas and parts of the United States and northern Mexico. Those weapons were made to hunt animals, including mammoths and mastodons, from 13,000 to 12,700 years ago. Additional coauthors are from Texas A&M, Baylor University, and the University of Texas. The North Star Archaeological Research Program and the Elfrieda Frank Foundation funded the work. Did ancient hunters throw these stone balls?